The slowdown in China continues, as evidenced by contraction in China Flash Manufacturing PMI, now at a seven-month low. 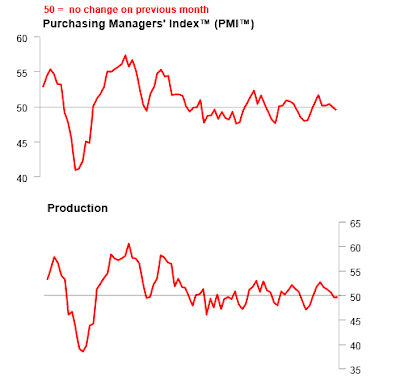 Flash China Manufacturing PMI™ at 49.5 in December (50.0 in November ). Seven-month low. Flash China Manufacturing Output Index at 49.7 in December (49.6 in November ). Two-month high. The question, as always is whether or not this is just more meandering around above and below the expansion-contraction line. I propose energy is the key tell. With prices plunging, how much traction does the global economy have?